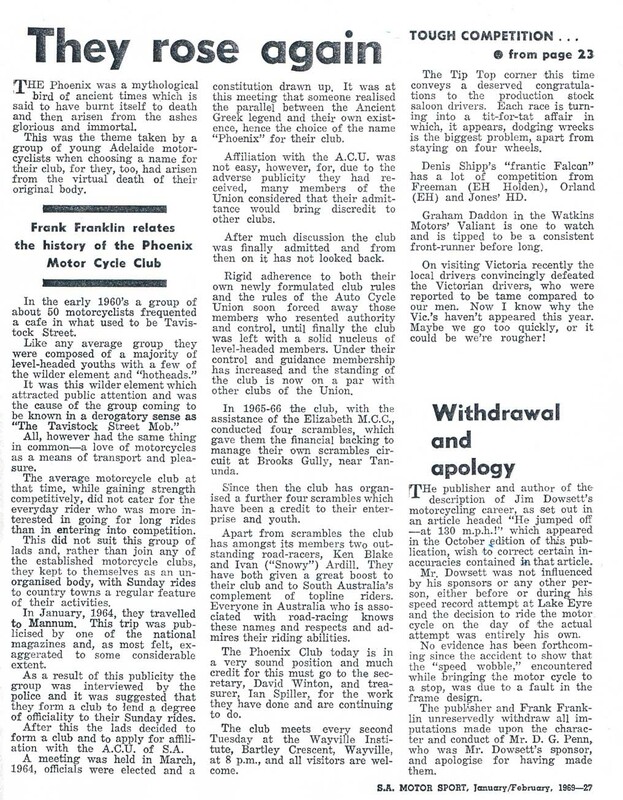 The following article written by Frank Franklin was printed in SA MOTOR SPORT magazine, February 1969. “The phoenix was a mythological bird of ancient times which is said to have burnt itself to death and then arisen from the ashes glorious and immortal. 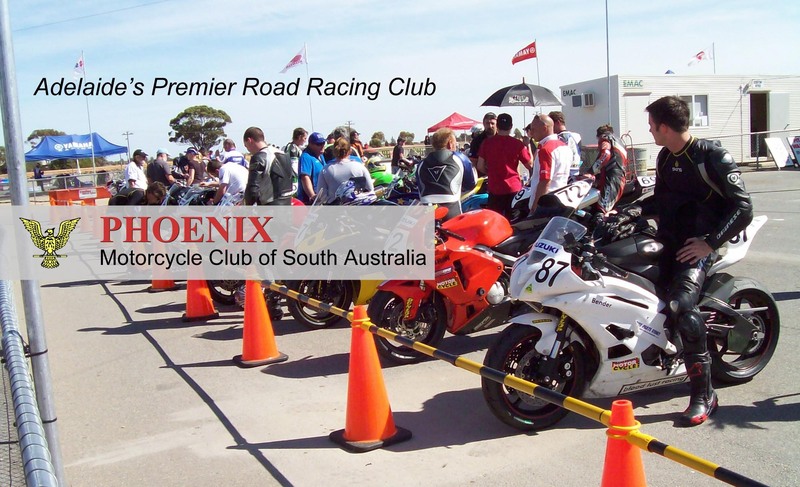 This was the theme taken by a group of young Adelaide motorcyclists when choosing a name for their club, for they too had arisen from the virtual death of their original body. In the early 1960′s a group of about 50 motorcyclists frequented a cafe in what used to be Tavistock Street. Like any average group they were composed of a majority of level-headed youths with a few of the wilder element and “hotheads”. It was this wilder element which attracted public attention and was the cause of the group coming to be known in a derogatory sense as “The Tavistock Street Mob”. All, however, had the same thing in common – a love of motorcycles as a means of transport and pleasure. The average motorcycle club at that time, while gaining strength competitively, did not cater for the everyday rider who was more interested in going for long rides than in entering into competition. This did not suit this group of lads and, rather than join any of the established motorcycle clubs, they kept to themselves as an unorganised body, with Sunday rides to country towns a regular feature of their activities. 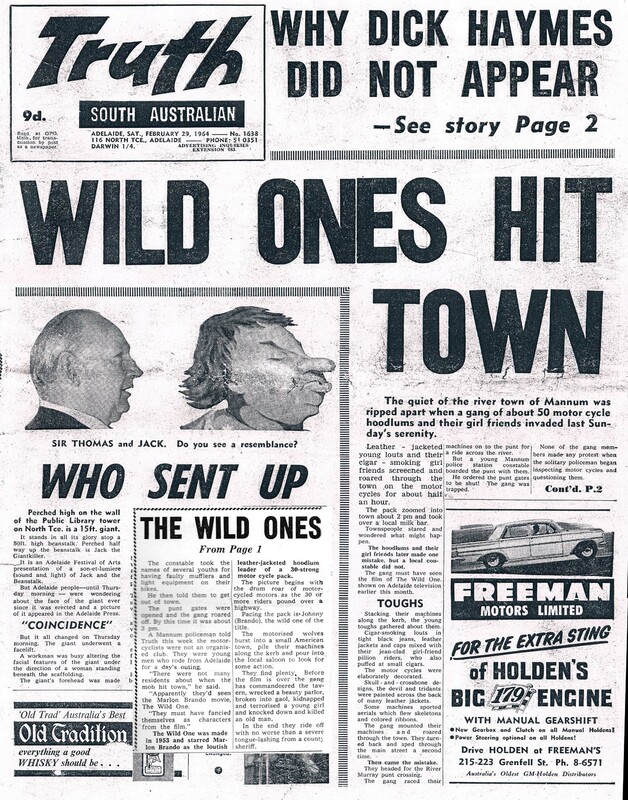 In January, 1964, they traveled to Mannum. This trip was publicised by one of the national magazines and, as most felt, exaggerated to some considerable extent. As a result of this publicity the group was interviewed by the police and it was suggested that they form a club to lend a degree of officiality to their Sunday rides. After this the lads decided to form a club and to apply for affiliation with the ACU of SA. A meeting was held in March, 1964, officials were elected and a constitution drawn up. It was at this meeting that someone realised the parallel between the ancient Greek legend and their own existence, hence the choice of the name “Phoenix” for their club. Affiliation with the ACU was not easy, however, for, due to the adverse publicity they had received, many members of the Union considered that their admittance would bring discredit to other clubs. After much discussion the club was finally admitted and from then on it has not looked back. Rigid adherence to both their own newly formulated club rules and the rules of the Auto Cycle Union soon forced away those members who resented authority and control, until finally the club was left with a solid nucleus of level-headed members. Under their control and guidance membership has increased and the standing of the club is now on a par with other clubs of the Union. In 1965/6 the club, with the assistance of the Elizabeth MCC, conducted four scrambles, which gave them the financial backing to manage their own scrambles circuit at Brooks Gully, near Tanunda. Since then the club has organised a further four scrambles which have been a credit to their enterprise and youth. Apart from scrambles the club has amongst its members two outstanding road-racers, Ken Blake and Ivan (“Snowy”) Ardill. They have both given a great boost to their club and to South Australia’s complement of topline riders. Everyone in Australia who is associated with road-racing knows these names and respects and admires their riding abilities. Note: in 2014 the club held a 50th anniversary dinner and a handful of 1964 members turned up for the occasion. Thanks John Lord for your help.